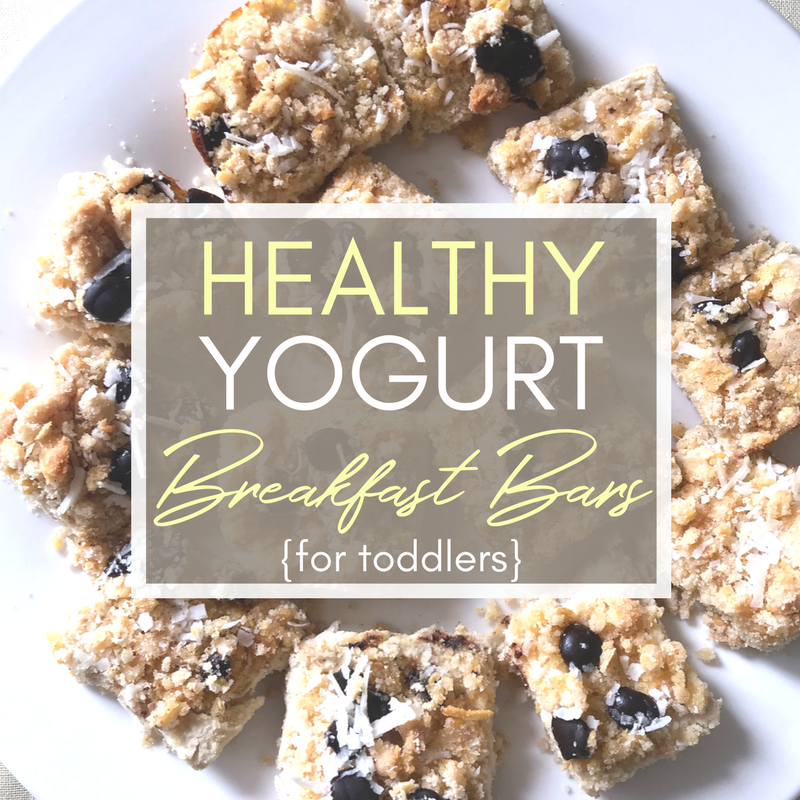 Healthy Yogurt Breakfast Bars that Your Picky Toddler Will Love! If you struggle to get nutritious food into your picky toddler, help is on the way! This is a delicious, easy recipe for yogurt breakfast bars (no refined sugar!) 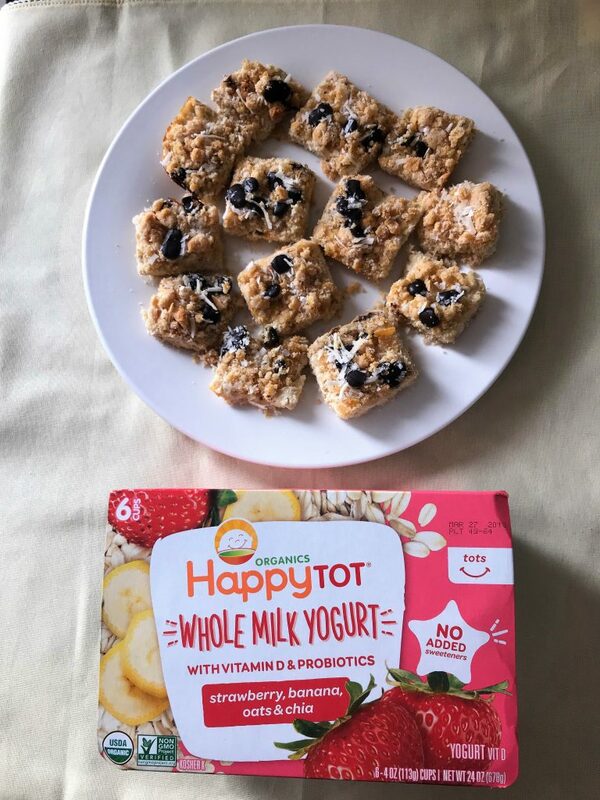 featuring HappyTot Yogurt that your toddler-critic will love! I’m not sure what happens in the time when a child is an adorable 9-month old baby who cheerily eats everything you give him and then turns into a finicky toddler who has narrowed down his diet to chicken nuggets and Cheerios. I’m sure many-a-mom has said, ‘He was such a good eater as a baby! I don’t know what happened!” Me either, sister. 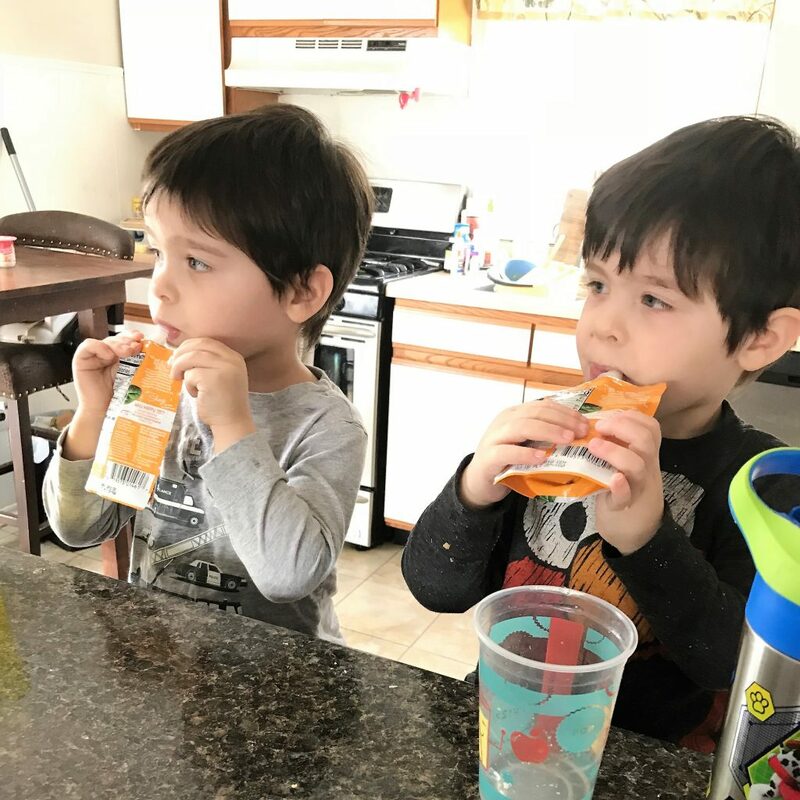 It is a daily struggle to get nutritious food into the mouths and down to the bellies of my two-year-old twin boys. The importance of this became ever so clear this winter when one of my sons was sick probably – six times? I lost count. And, on top of that, he has been complaining too often that his tummy hurts. Since 80% of our immune systems is derived from gut health and what we eat largely contributes to that, I knew I needed to up my game in the nutrition department. It was too important to just let him be picky. Most moms know that you have to be a little sneaky if you want to get healthy food into your little human. 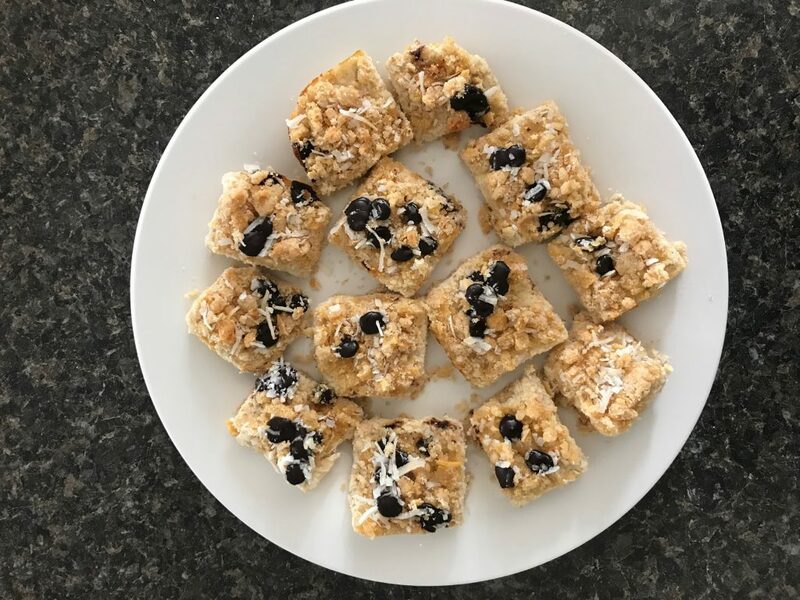 These yogurt breakfast bars can give you a little jump start to getting some covert nutrition into your willful toddler. It is mindfully made with probiotics – another key component of gut health. 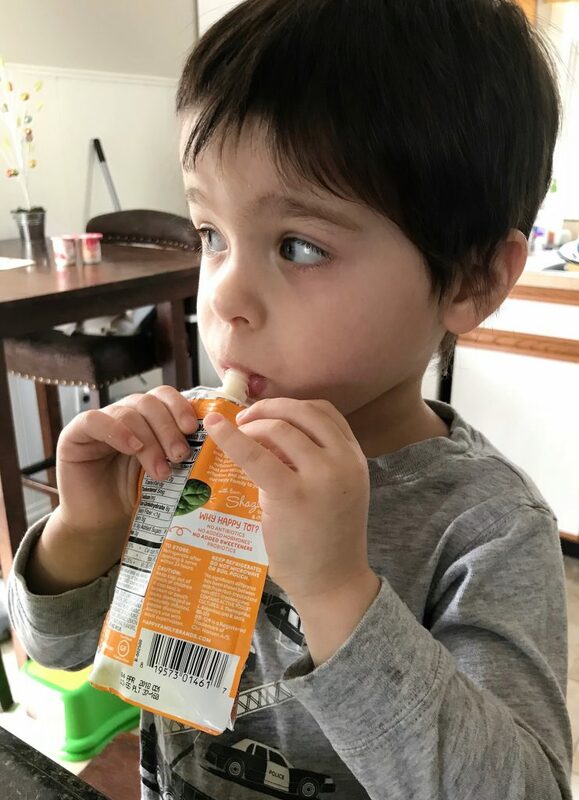 It is USDA Organic, made without toxic, persistent pesticides or artificial flavors, colors and sweeteners – again, free of other ingredients that are SO bad for growing kids (and anyone, really). It is non-GMO – another plus in my book. It’s made with Whole Milk Yogurt and Vitamin D – good, healthy fat. The HappyTot Yogurt that I used for this recipe also has other nutritious ingredients. Along with the strawberries and bananas, it also has chia and oats in it, which are gluten-free, rich in antioxidants and great sources of fiber. All good for tummy and overall health! This is super-important to me, especially as a mom of a kid who has been struggling with being sick all winter. Definitely give this HappyFamily a look. If you click here, you’ll get a $1 off coupon for HappyBaby and HappyTot Yogurt!! We used this same yogurt strawberry and banana yogurt for our breakfast bar recipe. 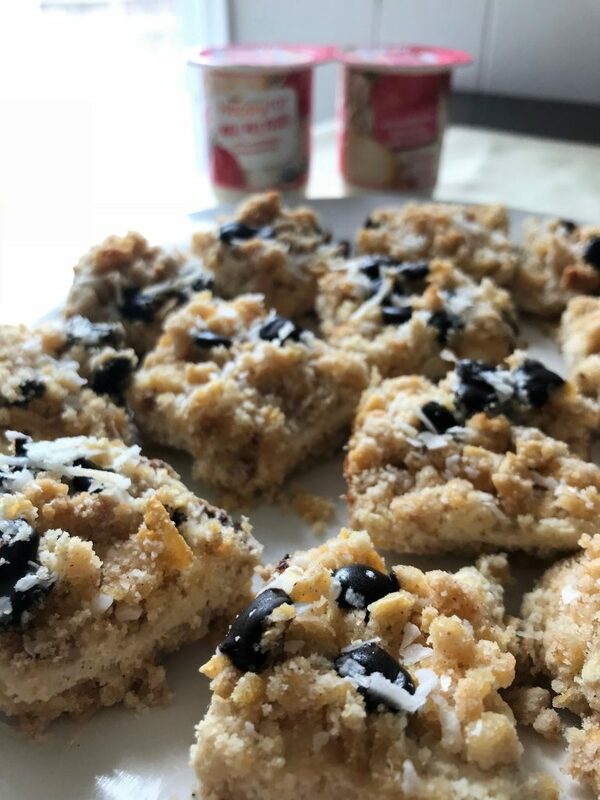 I tweaked this version to include some extra nutritional goodies like coconut flour (instead of white) and maple syrup (instead of sugar). It’s loaded with so many good things for your little one. You’ll find the recipe at the bottom of the post. Here are some pictures of these delicious bars and my boys gobbling them up! This is what the bars will look like just before going into the oven. Yogurt breakfast bars fresh out of the oven! There they go, nutritious food down the hatch! 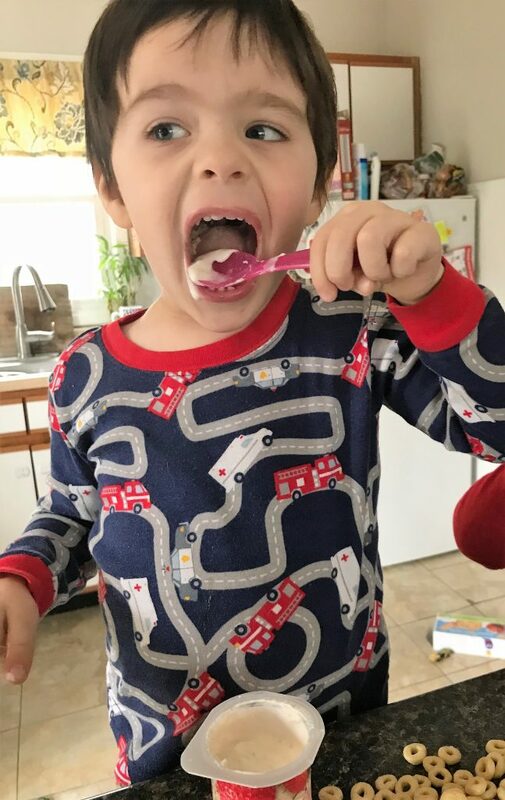 While I’m on the subject of yogurt, I want to share another HappyFamily product that my boys (and I) really loved, too. In addition, I also picked up the HappyTot Yogurt pouches. Yogurt pouches are my go-to bribery item when we are leaving fun places like the playground or the library. 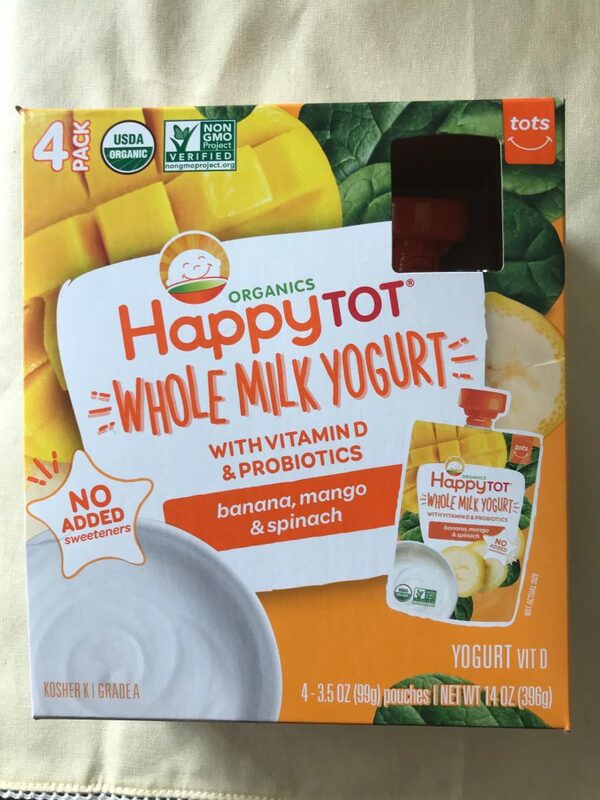 I especially love the HappyTot pouches because not only do they have fruit and yogurt in them, but they also have vegetables! 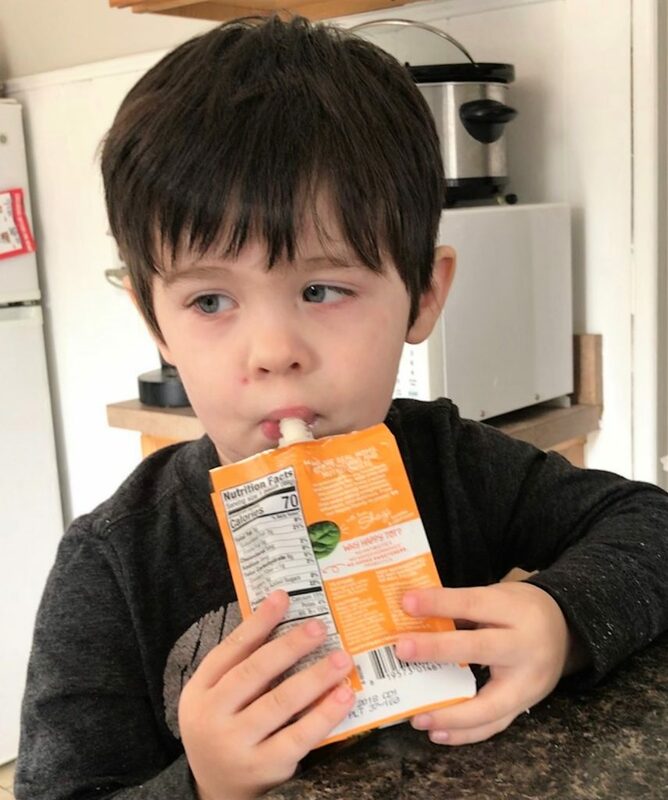 I bought the mango, banana, and spinach yogurt, and I was a little nervous that my boys might catch on to the vegetables. They did NOT! They sucked them down so fast and even asked for more later in the day! I LOVE that I can squeeze in another serving of vegetables without them even realizing it! 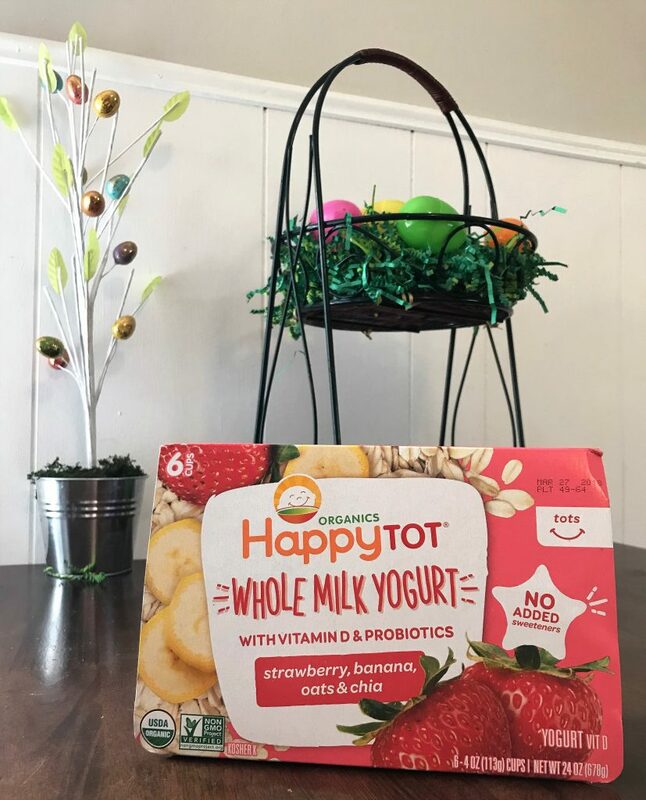 Healthy food for the boys, feelings of accomplishment for mom – HappyTot Yogurt for the win! OK, on to the recipe for the bars! Here it is, listed below! In a bowl, combine corn flakes, cinnamon, coconut flour, and maple syrup. Cut butter in 5-6 chunks and add into the mixture. 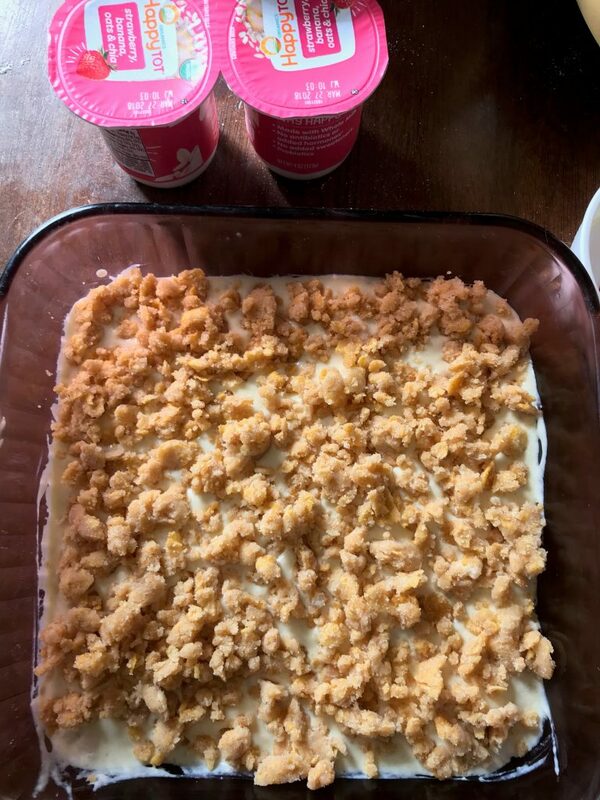 You made need to use your hands so the mixture becomes crumbly. In a greased 8x8" square dish, take 1/2 of the mixture and press it down firmly so it covers the surface. In a separate bowl, mix together yogurt, egg and 2 additional tablespoons of flour. Pour yogurt mixture into the dish, covering the bottom ingredients. Crumble remaining mixture over the top of the wet ingredients. Cook for 25-30 minutes, or until edges and top are lightly browned. 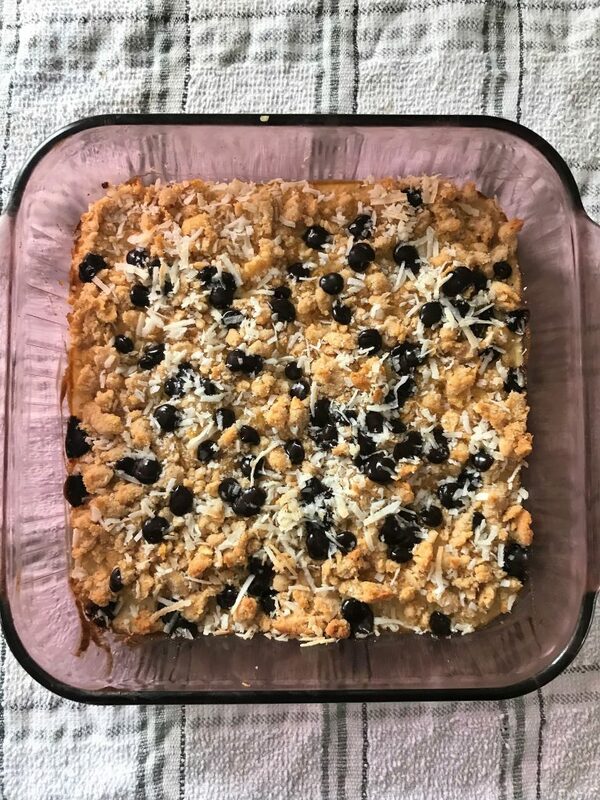 About 10 minutes before the bars are done, sprinkle carob chips and coconut over the top and lightly press down. 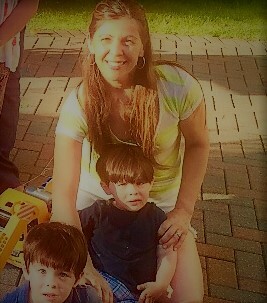 So happy to find a genuinely healthy product I can give to my boys and include in recipes as well! 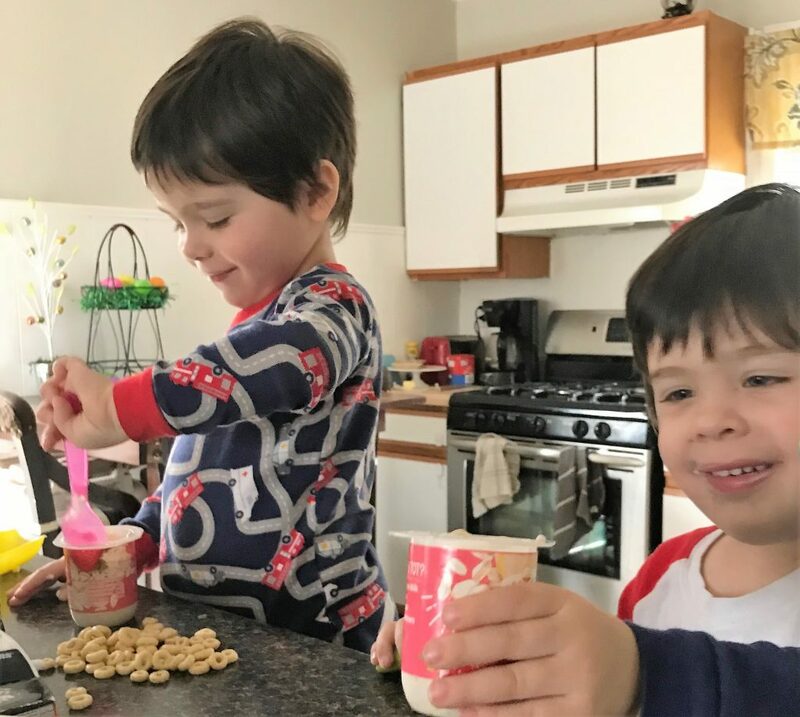 These yogurt breakfast bars were a hit with the boys, as were all of the HappyFamily Yogurt products! Don’t forget to get your $1 off HappyFamily Yogurt products! What are your favorite healthy go-to recipes for your picky eater? 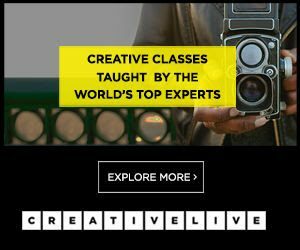 Any tricks that work? 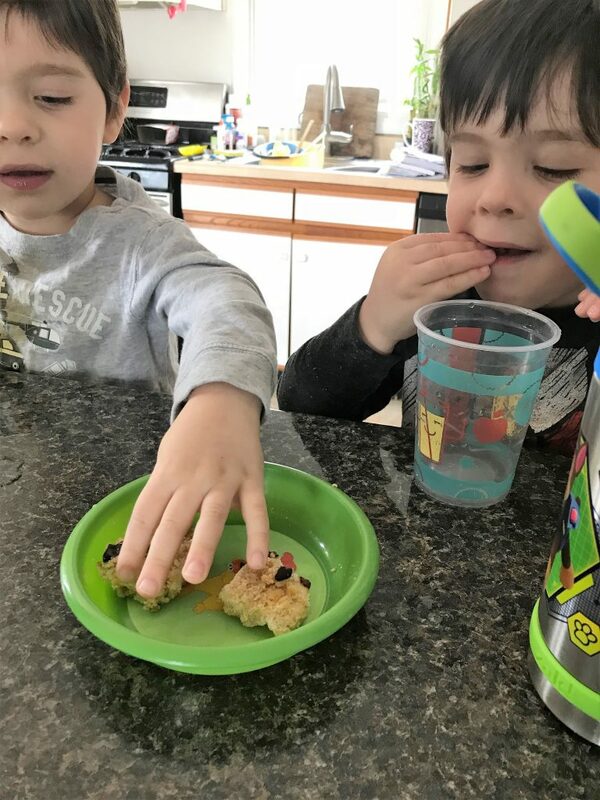 Looking for a fun recipe to try with your toddler? These Spring Butterfly Chocolate Chip Cookies are a blast to do together! I love the pictures on this post! You should also add "that your picky husband will love." My husband loves blueberries, I'm going to give this a try!